41 mm stainless steel case, transparent back, domed scratch-resistant sapphire crystal anti-reflective treatment on both sides, unique two-zone opaline-silver dial that delivers an instant impression of refinement, Caliber Omega 8900 self winding movement with co-axial escapement, chronometer, date, approximately 60 hours of power reserve, stainless steel bracelet. Water resistant to 10 bar (100 metres / 330 feet). 41 mm stainless steel case, transparent back, domed scratch-resistant sapphire crystal anti-reflective treatment on both sides, unique two-zone blue dial that delivers an instant impression of refinement, Caliber Omega 8900 self winding movement with co-axial escapement, chronometer, date, approximately 60 hours of power reserve, stainless steel bracelet. Water resistant to 10 bar (100 metres / 330 feet). 41 mm stainless steel case, transparent back, domed scratch-resistant sapphire crystal anti-reflective treatment on both sides, unique two-zone bronze dial that delivers an instant impression of refinement, Caliber Omega 8900 self winding movement with co-axial escapement, chronometer, date, approximately 60 hours of power reserve, stainless steel bracelet. Water resistant to 10 bar (100 metres / 330 feet). 41 mm stainless steel case, transparent back, domed scratch-resistant sapphire crystal anti-reflective treatment on both sides, unique two-zone opaline-silver dial that delivers an instant impression of refinement, Caliber Omega 8900 self winding movement with co-axial escapement, chronometer, date, approximately 60 hours of power reserve, black leather strap. Water resistant to 10 bar (100 metres / 330 feet). 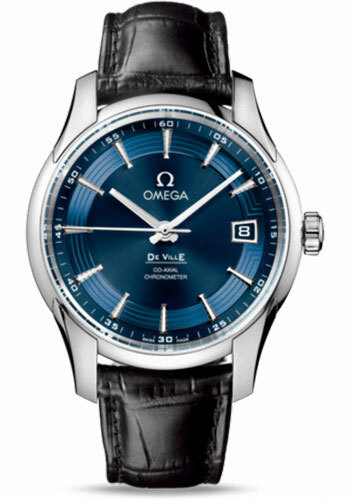 41 mm stainless steel case, transparent back, domed scratch-resistant sapphire crystal anti-reflective treatment on both sides, unique two-zone blue dial that delivers an instant impression of refinement, Caliber Omega 8900 self winding movement with co-axial escapement, chronometer, date, approximately 60 hours of power reserve, blue leather strap. Water resistant to 10 bar (100 metres / 330 feet). 41 mm stainless steel case, transparent back, domed scratch-resistant sapphire crystal anti-reflective treatment on both sides, unique two-zone bronze dial that delivers an instant impression of refinement, Caliber Omega 8900 self winding movement with co-axial escapement, chronometer, date, approximately 60 hours of power reserve, brown leather strap. Water resistant to 10 bar (100 metres / 330 feet). 41 mm stainless steel case, transparent back, domed scratch-resistant sapphire crystal anti-reflective treatment on both sides, sun-brushed blue dial is accentuated by a bluish hour track, Caliber Omega 8900 self winding movement with co-axial escapement, chronometer, date, approximately 60 hours of power reserve, unique leather strap. Water resistant to 10 bar (100 metres / 330 feet).